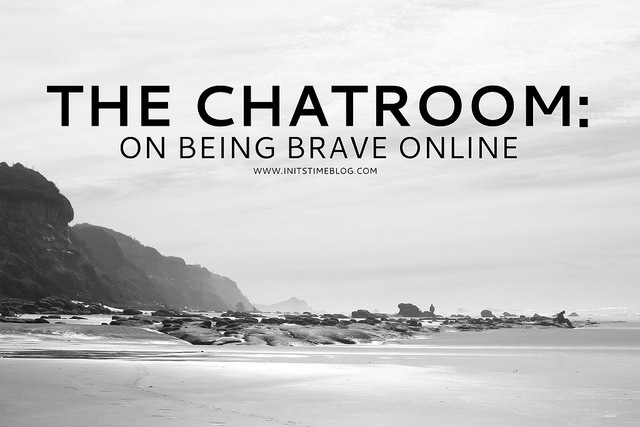 THE CHATROOM | BEING BRAVE ONLINE. I've always been a huge fan of Ashlee's work. Her writing is phenomenal, for lack of a better word and her photography is so crisp and bright and so real. She has a very real, honest, and open aspect to her work. And it's always such a breath of fresh air in a world full of cliches. When I read her post on bravery, I knew it had to be a Chatroom post. It had to be shared, to be discussed, to be talked about. As bloggers, we share a lot. Some would say we over-share and over-document our lives. But as artists and creatives, it's who we are. And it's who we were made to be. So I'll let you take a moment to read her work for yourself (right here!). As for me, I'm not brave. I've never been. I'm a timid, worrywart. I don't talk about half the stuff I do online in real day-to-day conversations. But as the posts go on and as I get more feedback from and converse with fellow bloggers, I realize that my brave space is my blog. That's where I find the freedom and the safety to post the scary stuff. To be honest about singleness, my faith, and my life as a twenty-something. It's where I find that I can be the person I was created to be. But it wasn't always like that. And it isn't always like that. I was so scared to publish my first post on singleness. I had never shared my story before, let alone shared it on the internet for all eyes to see (or search and find). And it still scares me, to this day. I still hover over that orange Publish button on Blogger. I still take a moment and look through my words before I do it. And if I think too much into it, I will save it in my drafts for later. But my story needs to be told. I can't hold my passion, my dreams, my life and keep it to myself. My love for writing and storytelling and taking photos is something I know needs to be shared. Not for fame, but for connection. I want to connect and learn from others and I know that this is how I'll get my voice out there. So yes, I'm still scared on the outside, I will always come across as a very quiet, introvert because that's who I am. But I will never lose this side of me, either. Pursuing new dreams and sharing life with you is a part of me. And it's a part of me I don't want to lose, even if it's scary. So what does bravery look like to you? Do you consider yourself brave in terms of sharing your art and sharing your work? Does it differ from you in real life vs. on your blog? p.s. I know we're all grown bloggers/readers here, but please be kind when commenting and responding. This new series was created to connect and reflect, not to bash! I think that just having a blog, and sharing your story with the world is brave. However, I find it difficult to be brave beyond that. To me, bravery goes hand in hand with confidence, and while there are things I'm confident about, there are just as many in which I'm severely lacking. For example, when promoting my blog or working with a brand to collaborate, I think to myself "Why would they want to read about/work with me? I have such a small blog and I'm not like so and so..." Or when I think about applying for (or just searching for!) a job, I talk myself out of it before I can even apply! To me, bravery is feeling that fear, but then taking the plunge anyway. And until I read that article, and what you wrote, I hadn't really thought about what I might be missing out on because of my lack of bravery. A-M-E-N! I'm not one to fill in blanks with negative comments, but other than that, I can definitely relate. I've really noticed that I'm writing safer and also differently. Sometimes I think that blogging is ruining my writing. I try to say things in a way and format that will be pleasant to read and sometimes that means whole ideas are completely lost. I have plans to write posts, even if they feel like essays, and not worry about how many people read or not. I'm just going to go for it. That little part of me that wonders if someone will or will not like it tends to speak quite loudly at me! :) But I've found that if I let myself think and ponder and listen to that voice, I'll never share anything. Like you said, it can definitely hold you back and be frustrating, too! And I totally get what you mean about being brave. I may be able to post blog posts, but I'm most definitely NOT brave in many other aspects of life. I'm afraid of heights, traveling alone, speaking up in groups, as well as many other things. But like you said, being brave means taking the plunge and accepting a challenge--and living life to the fullest, too. Here's to bravery, friend!! Yay for good timing! I've been trying to think of which post I want to write about and as soon as I read Ashlee's post, I knew it was IT. :) Speaking of which, I am so glad you found her blog! She's a true gem in the blog world and I've admired both her photography and her writing for a few years now. I just can't stop reading it! But in terms of your posts, I've always found you to be honest and open. And it's one of the reasons why I keep coming back!! For of all, I am now slightly obsessed with Ashlee's blog! She's such a good writer (which if you didn't know I'm rather picky about). I think it's taken me a long time to be brave. First, on the blog. 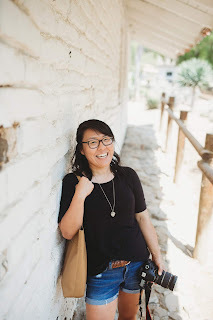 It will be 5 years in May that I've been blogging at The Lady Okie, and it took a few years before I was totally confident sharing about my blog to real-life friends and family. It's scary! But I've actually had the most fun because they really seem to enjoy reading it, and it's fun to share that part of my life with people I love. I feel like I'm pretty open and personable on my blog. My friends say it's like I'm sitting there talking to them. Sometimes that's hard to be so open with strangers and people who know you in real life, but the more you do it, the easier it gets. I'm not really afraid of being honest or real, because I am a complete disaster mess, and why should I hide it? We all are, and anyone who pretends they aren't is just lying to themselves and everyone else. Then, being brave in real life. I used to be an introvert... or at least I was much more reserved. But I've had the opportunity to push myself outside my comfort zone--first in moving 4 hours away from my hometown to go to a college where I literally knew no one. Then, moving away from my family again when I came to Oklahoma for a job. Again, I knew no one. I had to make friends, find a church... all by myself. Being in those types of situations really forces you to be brave, because it's either jump in and make friends or sit and home alone and be lonely. Yes I definitely agree that there's freedom in honesty! One of the things I didn't expect was when I am vulnerable online I get shy in real life. Like if I post something about nursing and then my coworkers mention it to me while I'm at work I'm not always sure how to respond. Seems like the human spirit is just generally uncomfortable with being vulnerable- especially to those we don't feel like we know very well. I'm glad that you've found my posts honest and open- that's encouraging to hear as I consider it a continual work in progress! That said, I love what you said about the human spirit being generally uncomfortable with being vulnerable. There's so much truth in that sentence! As for being brave in real life, that's somewhere where I still struggle. It's much easier for me to share my life online than in person because I am an introvert and don't really like talking about myself. But I like that you pushed yourself and put yourself out there in college--I think that that's something I need to work on now!! So true, so true! And thank YOU for commenting and sharing your thoughts on my blog!